Being at the homecoming game and seeing all the alumni come back to Athens to support the Bulldogs got me thinking about the traditions we have at the University. Some of the football traditions go all the way back to 1892 when the Bulldogs played their first game (and won, 50-0!) against Mercer on what is now known as Herty Field. Some traditions are just getting started today, and may continue to live on long after current students have graduated and left Athens. Silver Britches. An innovation of Coach Wally Butts (head coach in 1939), the pants make a great combination with the bright red jerseys the Bulldogs wear at home. The Bulldogs&apos; silver britches have been referred to over the years in chants an banners, but the phrase really caught on in the 1950&apos;s. Coach Vince Dooley re-designed the uniform to have white pants, but the silver britches were re-instituted in 1980, the year the Bulldogs last won the National Championship. "Glory, Glory". The school fight song is one of the oldest and most lasting traditions in school history. It is sung to the tune of "The Battle Hymn of the Republic," and has been sung at the games since the 1890&apos;s.
Georgia Bulldogs Cheer. At some point during each game, the cheerleaders hold up signs on each half of the stadium to get everyone to change "Georgia" and "Bulldogs". It&apos;s simple but everyone gets really into it! Redcoat Band. The University&apos;s 375-member marching band which dates back to 1905 and has won numerous awards over the years. The Chapel Bell. In the 1890&apos;s, when the playing field was located only yards away, freshmen were ordered to ring the bell until midnight in celebration of a Bulldog victory. Fans, students, and alumni still rush to ring the "victory bell" after a win to this day. After last year&apos;s win against the rival Florida Gators, Georgia fans rang the bell with so much excitement that it actually broke. "Between the Hedges". This reference to UGA&apos;s Sanford Stadium dates back to the early 1930&apos;s when the now-famous hedges were only a foot high and had to be protected by a wooden fence. Since I&apos;ve been a student, I&apos;ve witnessed the birth of a few new traditions. While they may not be as long-lived as the above traditions, they have been fun to get into over the last few years. Blackout. 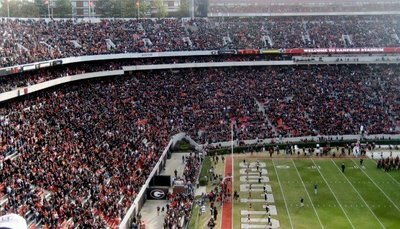 Starting at last year&apos;s Auburn game, Mark Richt requested that Bulldog fans unite to all wear black and transform Sanford Stadium&apos;s typical sea of red into a blackout. In addition, the team came out in original black jersey&apos;s for the occasion. The excitement of it all was enough to bring a 45-20 win against one of the University&apos;s biggest SEC rivals. The jersey&apos;s were worn again at the Sugar Bowl, which resulted in a 41-10 victory against the previously undefeated Hawaii. However, after the loss to Alabama a few weeks ago the Blackout tradition may not live on as long as intended. "Soldier Boy". This popular rap song and the ensuing dance craze were all over Athens last year. When the Bulldogs needed a pick-me-up in the Auburn game, the song was blasted over the loudspeakers and students and athletes alike spontaneously broke into the dance both on the field and in the stands. At several other games throughout the season, this song was played to pump up the crowd and the team. "I Put On For My City". Another popular rap song, this seems to be the Soldier Boy of 2008. It has been played at all of the home games this season, and the stadium goes wild every time. Who knows, maybe in 100 years students will talk about those oldies songs "Soldier Boy" and "I Put On For My City" that Bulldogs used to cheer to way back in 2008.